"Scioto Lounge" involves three anthropomorphic deer that overlook the Scioto River in downtown Columbus. High Street, especially around the Short North, has long operated as the center of Columbus’ arts and culture scene. As part of the city’s Streetscape Improvements Project, High Street may soon become a haven of public art, as well. Columbus is dedicating $25.5 million to rethink and reshape High Street between Goodale Park and Ninth Street, eliminating a traffic lane and making the area more hospitable to pedestrians. But that project isn't just about convenience and safety. City Council just approved an $81,000 contract with the Columbus-based firm Designing Local to create a strategic public art plan, something that officials hope will pave the way toward a city-wide master plan for designing and employing public art. Amanda Golden, the managing principal of Designing Local, says the city doesn't want to simply come into an area and say, "This artwork goes here." "In order for us to do a plan that is owned and excited and appreciated by the people who live and work and love High Street, we are spending a lot of time on community engagement," Golden says. This week, the city kicked off a series of public meetings to introduce the High Street project and discuss what residents want in terms of art. Golden says they don't come in with any preconceived notions, because every community has different values that they want reflected in their art. The city will hold meetings through September, taking suggestions in-person and through an online survey, come up with a proposal, test that back with residents, and then finalize a plan by November. The art itself, though, could take a number of forms: Sculptures, murals, light displays, even projections. "So really the sky's the limit, or your budget's the limit," says Lori Baudro, the city's public arts coordinator. "Your imagination's the limit." For this project, the public art budget is just $420,000. That's about 2 percent of the total streetscape improvement budget. It's also the biggest public art project Columbus has taken on since the Columbus Art Commission was established. Started at the end of 2007, the Columbus Art Commission is tasked to approve any art that's acquired or commissioned by the city, as well as its design and placement. It also oversees any art proposed anywhere within the public right of way or on city property, and make sure that the city's existing artworks are kept up and restored if needed. But it wasn't until 2014 that the Department of Development's public art program received any money to buy new works, with then-Mayor Michael Coleman setting aside $200,000 from the capital improvements budget. Since then, the city of Columbus has spent about $800,000 on public art, with more projects in the works. "Flowing Kiss" is a public artwork created by Lawrence Argent for the city's bicentennial. The piece that kicked everything off was "Flowing Kiss," which was commissioned for the city's bicentennial and installed in October 2013. 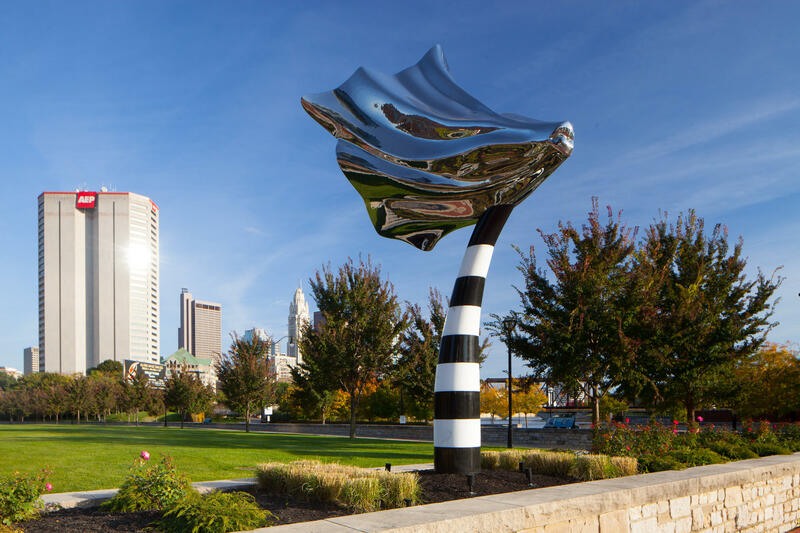 Located on Neil Avenue at North Bank Park, at a cost of $250,000, that work consists of two large, stainless steel lips that swoon outwards like flowers. If you walk by the banks of the Scioto River, behind COSI, you might run into another notable piece: "Scioto Lounge." Terry Allen, an artist from Santa Fe, was commissioned for about $400,000 to create three anthropomorphic deer, two of which overlook the waterfront from Genoa Park. A third deer, installed in September 2016, hangs around on the Rich Street Bridge. The city's most expansive project was a series of nine public art bike racks, the designs for which were submitted from the public, reviewed by a panel and voted on. Those pieces, installed at recreation centers and public utilities around the city, span from the Columbus skyline to colorful bouncing balls. "We had a budget of about $10,000 per bike rack, which is an expensive bike rack or a very inexpensive piece of public art," Baudro jokes. With the exception of the bike racks, though, the public art installed by the city hasn't exactly been distributed evenly across the city. In part, Baudro says that's because the opportunities have been there. "Certainly the projects we've done so far, a lot of them have been downtown," Baudro admits. "That's sort of everybody's neighborhood." 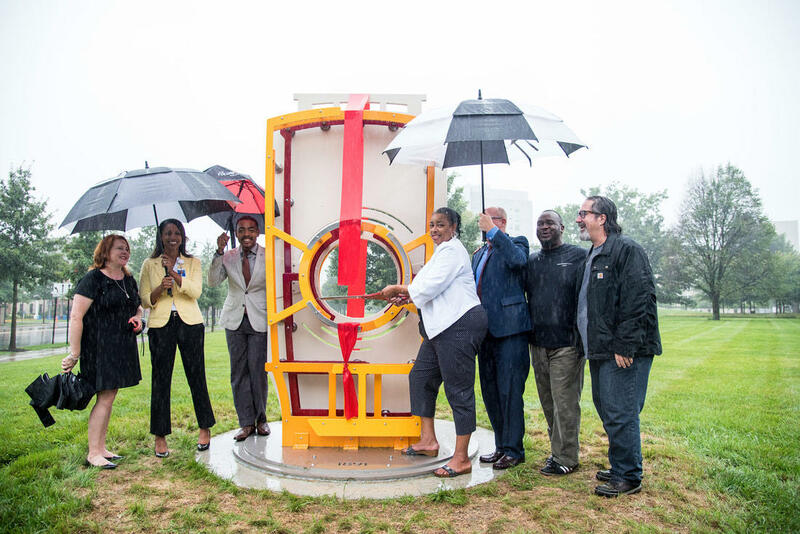 A streetcar sculpture by artist Tom Hubbard was unveiled in Livingston Park in July 2017. Of course, the city of Columbus isn't the only entity involved in or funding public art here. There are pieces scattered already from the Short North to Dublin. Columbus partnered with the Neighborhood Design Center on a streetcar sculpture for Livingston Park, and is working with the Harrison West Society for a piece called "Through" at Harrison Park. The Greater Columbus Arts Council and the Historic Preservation Office are involved in this venture as well. Baudro says individual neighborhoods are trying to fundraise for their own public art, and the city is looking for how to help those that can't. “We want to make sure that how we do the art is equitable," Baudro says. "Certainly when you go around to neighborhoods, they’re not saying they don’t want art. Everybody wants art, and they’re figuring out their own ways to fund it and go about it." Columbus right now lacks the one thing that can help reach that goal: A public art master plan. Baudro says cities like Sacramento and Louisville have city-wide plans for how to approach and distribute public art, leading to more robust programs. She hopes the High Street plan, and the feedback the city receives about public art, will help them figure out how to do public art on an even larger scale. 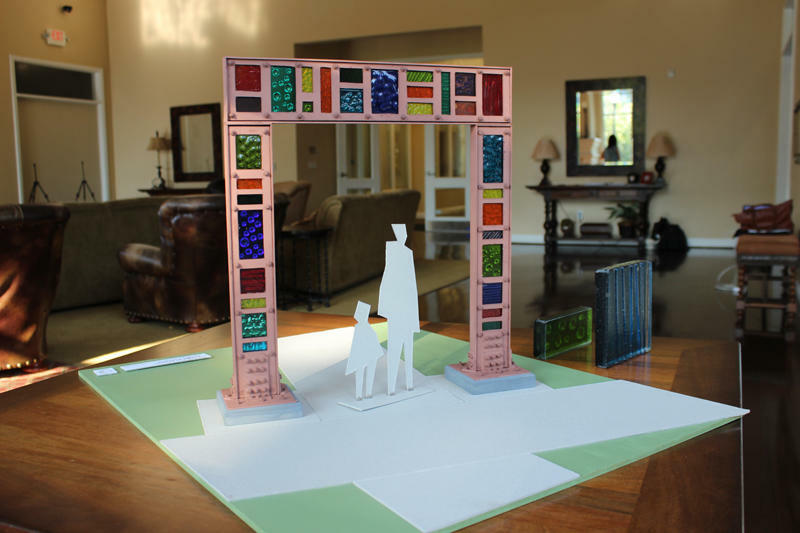 "Through," a work by artist Todd Kime, will be installed in Harrison Park in November 2017. Baudro's hope is for Columbus' art to be memorable and location-specific, adapted for this city alone, and to include more Central Ohio artists among the works. Budgeting for temporary pieces, not just permanent installations, will help widen their net. Inevitably, she says, if public art is something that residents value and appreciate, it will be something that visitors to the Columbus appreciate too. Earlier this year, the city of Columbus commissioned a study on the use of tax incentives in four different neighborhoods: the Short North, Linden, Near Eastside, and the Hilltop. Researchers found that in the Short North, generous tax abatements were not necessary to spur certain types of residential development. Who Maintains Cleveland's Aging Public Art? The 28-foot-tall replica of a rubber stamp perched next to Cleveland City Hall today appears polished, its red handle gleaming in the sun. This whimsical sculpture, known as “Free Stamp,” was created by Pop artists Claes Oldenburg and Coosje van Bruggen over 30 years ago.